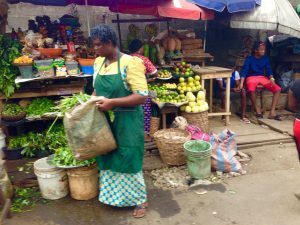 This article focuses on the ten most popular Warri Markets in Delta State but there are several markets in Warri but we are focusing on the most visited and biggest Warri markets because these markets all have their unique features which have distinguished the different markets as the top Warri markets and these factors are based on their sizes, location, and their popularity. Warri markets are all characterized and identified with some specific products and items. Also, other parameters are used to describe different types of Warri markets like cheaper price rates, cleanliness, dirtiness, and the dominant tribe or ethnicity of the people living in the location of that particular Warri market. The city of Warri can be rightly called the commercial capital of Delta State because of the Nigeria Ports Authority (N.P.A), The Warri oil refinery, markets, and a cosmopolitan identity justify the above call. Focusing on markets, through social studies to commerce we know a market is a place where people buy and sell goods. Warri Markets are likened to the organs of the human body that is each organ has a unique responsibility likewise Warri markets are known to have in abundance some specific goods and services or to get cheaper price rates on some particular products or services. “Wetin you wan buy?” is a common rhetoric you get when you are inquiring about a market in Warri, meaning the choice of market destination depends on the item(s) of interest. Multi-item shopping would probably require stops at more than one market. This is not a conclusion that all markets in Warri sell only one item, No, but some markets are better suited to buy certain and specific items. We have listed 10 popular Warri Markets in no particular order but they are all the best 10 markets in Warri Delta State because of the size of the market, the unique items they sell in the market, the population of sellers and buyers in that market, the locations of the market in Warri and the ease of doing concluding a business transaction even parking space for your car is another reason for listing the top 10 most popular Warri Markets in Delta State. Main market is quite sizeable and it is one of the finest, neatest of all the different Warri markets. Main market is your one-stop destination for prints (wrappers), lace materials, traveling bags and boxes, traditional regalia like beads, walking sticks, hats etc. You can buy items for both retail and wholesale quantities with an authenticity of products guaranteed. You are sure to buy the listed products above in cheaper, in quantity and in all shades and types because of the traders of such goods and services are basically concentrated in main Market Warri but you can still get such items in other Warri markets. Main Market is situated in the heart of Warri and it is along the major Warri/Sapele road. Igbudu market is one of top Warri markets which started during the post-civil war era and it is among the biggest Warri markets in Delta State. Igbudu market is reputable for the sales and buying of food items in any quantity both for retail and wholesale purposes. This market has also carved a name for the sales and buying of groceries, provisions, and cosmetics and beauty products which are also available in both retail and wholesale quantities. 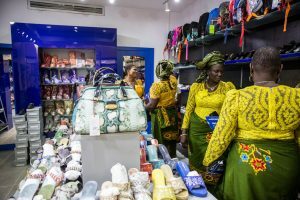 Most provisions, cosmetics and beauty shops in Warri purchase their products from Igbudu market because their price rates are cheap and affordable. All these contribute to making Igbudu market one of the busiest of all Warri markets. There is always traffic-jam on a daily occurrence caused by the movement of people in and out of the busy Warri market per second and Igbudu markte cuts across Bazunu and some parts of Warri/Sapele Road. Igbudu market is one of the top ten most popular Warri Markets in Delta State from our research. Igbudu market located in Bazunu Road, Igbudu. The name Ibo market can be very misleading because it does actually suggest a tribal or traditional market but it is not so totally but it is one of the most popular of all Warri markets because of the unique feature of the market. The name Ibo market stuck to this clean Warri market after the civil war because the Ibos predominantly traded at the location and it was just accepted by all but it is more if a mixed affair now between the different ethnic tribes and groups in Delta State. The Ibo market which is one of the cleanest of all Warri markets is known to buy clothing apparels (T-Shirts, Jeans, Chinos Trousers, Suits, etc) and shoes. The Ibo market is Warri’s own version of the saint-Quen Flea market in Paris. With over two hundred shops and still counting that are all fully stocked in clothing items, inhabitants of the city are never far off from the latest fashion trends. The Ibo market makes the cut in the top most popular Warri markets in Delta State. 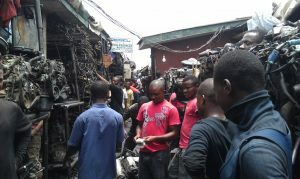 Ibo market is situated along Okere Road, Warri. Pesu market is pronounced “Kpesu” which is synonymous with the word “meat”. 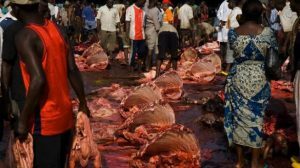 Pesu market is one of the most visited of all Warri markets because it is home to the biggest meat slaughter in Warri and might just be the biggest in Delta State. Pesu market is the city main abattoir and an average of 30 cows are slaughtered each day except Sundays. Pigs and goats are also slaughtered in commercial quantities. It’s fair to say that Pesu controls meat availability and supply in the city of Warri. This Warri market called Pesu has a jetty which links up to Warri River so butchers from other markets purchase their stock from this market. Pessu market is located along Market Road, Warri. Maciver market is one of the most popular of all Warri markets and it is reputable for sale of second handed clothes in whole and retail. 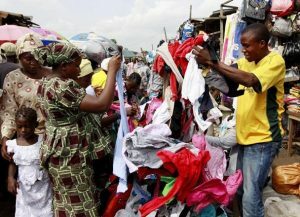 Mciver market is the biggest market in Warri where second-handed clothes are sold. 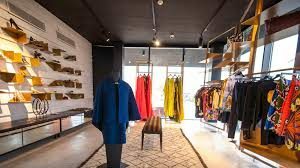 Maciver market gives everyone the rare opportunity look good and wear very good clothes because you can the prices of the clothes are quite affordable and the quality clothes are still very good. The second-hand clothes will compete with the top boutiques in the city when they have been properly dry-cleaned and rumor has it that many local boutiques in Warri visit Mciver market to pick and select these fairly used clothes and resell as new clothes after the owners of the boutique must have done a thorough dry cleaning and packaging of the clothes. So if you really need to buy some good clothes at cheaper rates all you need do is to pay a visit to Mciver market on a Monday morning because new stock of the fairly used clothes are opened every Monday and it is called new bay. Thank us later if you have visited the market. 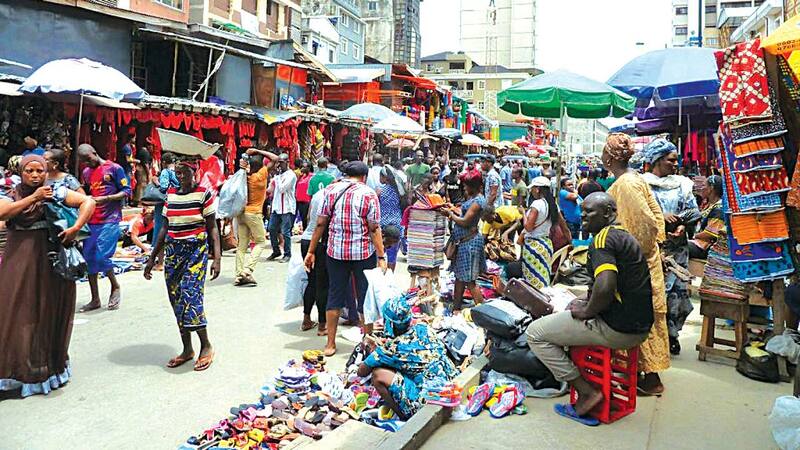 This Warri market offers a wide range of clothing items albeit in supposedly some have reduced quality but most importantly the clothes come cheaper price rates. Clothing items here are referred to as gbogbo or Okrika in Warri Pidgin. The Price rate of the fairly used clothes does vary based on the “newness” quality and time of purchasing the clothes. The fairly used clothes are categorized as grade one two and three etc. Despite the reservations of some over the quality of items most don’t mind because after proper washing and packaging it becomes almost impossible to differentiate gbogbo from the “brand new ” and I bet you that Alibaba, Ay, Igodie, Igosave, Richard Mofe Damijo, Harrysong, Erigga, YungSix, and all the top Warri born entertainers and comedians have all visited this market at some point but nor quote us o. Maciver market is definitely one of the ten most popular Warri markets in Delta State and it is also located along market road, Warri. Effurun market is also very popular of all Warri markets because it has weekly market day. Effurun market is arguably one of the most busiest of all Warri markets in Delta State on its market day. The market has the highest influx of customers on its specific day and it occurs every seven days. On the Effurun market day foodstuff, groceries, provisions, cosmetics, clothes, shoes, bags can be purchased at ridiculously cheap prices. The market day is so popular such that traders from other towns and villages around Warri come to sell on the Effurun market day. Effurun market has its inception dating back to before the civil which makes it one of the oldest markets not just in the city of Warri but in Delta State as well. The traffic jam caused by this market is really thick because it is situated along the Effurun Sapele road which cuts into PTI road. The main market is inside the Effurun village proper but on its market days the market is expanded beyond the village and cuts across all the major roads. This one of the landmark Warri markets because of the cheap rates to buy goods and it is definitely in the list of the 10 most popular Warri Markets in Delta State. Effurun market is open for traders every day but it is biggest on the market day. The Obgeijo market is a renowned Warri Market which is populated by the Ijaw speaking ethnic tribe in Delta State. Ogbe-Ijoh market is populated by the Ijaws who are mainly fish traders. The Ijaws natural habitat is water so fishing is the major employment. Ijaws are naturally fishermen by birth and as Pesu market is to meat so also is the Obge-Ijoh market is to fish. 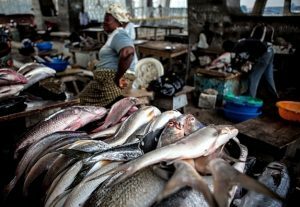 The market is the Seafood ingredients hub of Warri city and its close proximity to the Warri River enhances its suitability and relevance to the role. Fish (scaled, un-scaled, small, large, fresh), crabs, crayfish, shrimps, prawns, periwinkle etc are some of the items you can get in abundance at the market. 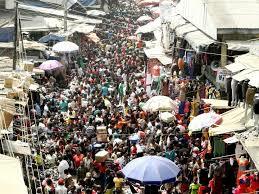 Definitely, the Obgeijo market is one of the 10 most populated Warri markets. It is also located along Market Road, Warri. Polokor market is one of the more recent markets in Warri city, the market falls into the Jack of all trades but master of none category. Polokor market is just the normal market to buy foodstuff, provisions and basic household items. It is purely a retail market becaude the prices are just better than shops close to the house. Polokor market is a makeshift market because most of the items are for retail purposes but one very important thing about this market is that you will definitely get to buy everything you need if you can’t go to the major Warri markets. Polokor market is about the biggest in Ugborikoko and Ugboroke so the areas around it like Arubayee, Giwa-Amu, Okere-Ugborikoko, Idiaregbe, Omovughe areas of Warri constitute the majority of the customers who visit Polokor market. Unlike the other markets highlighted above, the Polokor market is not renowned for any particular item. 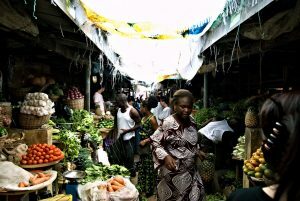 The Market is quite popular so it is one of the 10 most popular markets in Warri. 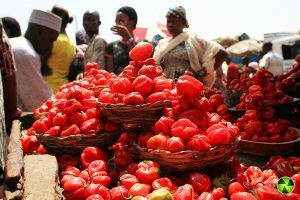 Like Polokor market, it is also one of the new markets in Warri that sprung up out of necessity and it is quite popular and fairly big in size but it also falls into the jack of all trades category but with more variations in products available. Along with foodstuff and provisions stalls, Boutiques and electronic shops are features of this market not present in the polokor market. This market also services a different axis with customers mainly from the Okumagba Avenue, Okere road Enughe Axis. It is on our list of the ten most popular Warri markets because of its strategic location. This industrial equipment niche came into existence not too long after the civil war. The market was an offshoot of McDermott industry. An American company in the business of steel fabrication. Traders in the market deal in the sales, lease, and hiring, Maintenance of heavy-duty equipment such as bulldozers, cranes, forklifts, self-loaders, industrial generators, Scaffolds etc as well as their parts. Also, PPE (personal protection equipment) like safety boots and gloves, goggles, helmets etc are also available. The market has close proximity to the famous but local Alawuru bottling industry. From the list above of the ten (10) most popular Warri markets in Delta State, it is fair to say that the city of Warri is blessed with several big markets. These Warri markets are unique in their respective rights because they are markets where you can easily buy specific items or general products. some of these Warri markets are known for specifics while others are just the normal market to buy everything. Having gone through the above descriptions we can see that markets in Warri are more than just stores and locations. As pointed out already, the choice of item(s) is directly proportional to the choice of the market(s). So when next you happen to be in the commercial capital of Delta State it is now easy for you to chose which market is the best option for you based on the item you want to buy. We may add to the list because not all the popular Warri markets are captured in this article. For example Robinson plaza which is the home of sales and repairs of Phones, laptops and for gifts items and households in Warri and others that we may write about. Thank you, For You kind words. Try to visit our blog for more contents. This is rather coming late. But thanks for visiting the blog and leaving this kind comment. Confirm sapele soups na u dey call warri food? Egusi pepper soup is my favorite. Confirm.. I have been to warri and have used most of the markets. The article is a blast. Great write up. I have virtually used most of the markets listed in this article. They are all unique and known for specific items. Polokor market is quite small with stubborn traders who are always on their shop spaces even on environmental sanitation days. The traders close very late also. The markets enlisted in this article are about the top markets in warri. I just got to see the blog and it’s really a nice one. I just love your blog. Good work and great insight into the popular.